One of the biggest dust storms ever observed developped on Mars last summer. 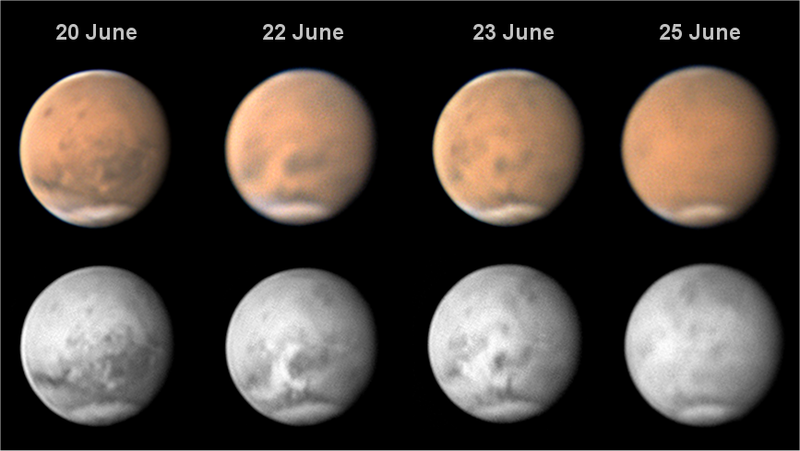 This article briefly describes the three states of the dusty martian atmosphere and how they can be identified on images: active storm, decay phase, clear atmosphere. Two things make that phase rather unmissable: the presence of convective dust clouds and that of atmospheric parts where the dust density is so high that the surface beneath becomes invisible. Both can be difficult to discriminate. In general however, the convective storms are the core of the activity and presents a very high albedo (they are bright) especially in red and infrared. Above: spread of the dust storm over the Solis Lacus region in late 2018 June. 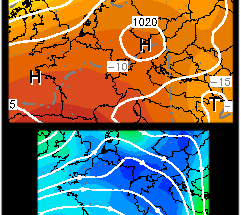 The surface is still well visible and contrasted on the 20th. On the 22nd, bright dust clouds have been raised. On the 23rd, they have been spreading further. On the 25th, the atmospheric environnement of the dust clouds have itself become opaque and the surface is almost not visible. 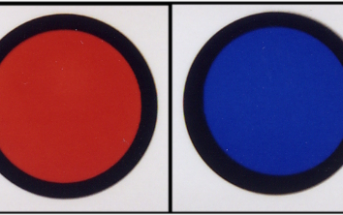 RGB and IR images. Clouds are convective because they are large amounts of dust raised by winds where strong differences of temperature happen. The edge of polar caps favours this mechanism but the night and day transition in the martian morning is a common place as well. The decay phase begins when the convective storms stop. At this moment, there is no more fresh dust to feed the atmosphere and the previously lifted dust is slowly beginning to depose itself on the ground. This is a very progressive phase that will last weeks or even a few months. On images, the surface details are visible again but with a markedly lowered contrast. 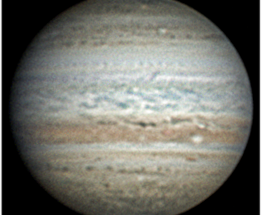 This state has often been missed by planetary imagers in their (understandable) hurry to get those details on images. A low contrast surface can indeed be artificially enhanced just by applying a stronger processing. Paradoxically, visual observers on their side remained well aware of the still highly dusty atmosphere as they keep complaining throughout August about how weak was the contrast still. The eye is not able to overprocess the view! The decay phase. Look at how, in the absence of active storms, the surface remains almost invisible at the western and eastern edges, especially at the terminator (west). See especially how Sinus Meridiani, on the darkest ground marking, disappears from view well before reaching the terminator as the globe rotates (as viewed from Earth: planet rotation is to the east). RGB images from August 7th and 8th, 2018. If the exact level of contrast would be very hard to appreciate in an objective way, at least one clue can be identified: ground features are becoming less and less contrasted as they approach the limb (or more and more when they approach central meridian). Indeed we are observing a globe and when watching the edges, the look crosses a thicker volume of the martian atmosphere, with a corresponding growing dust opacity. This effect is superbly visible on the image taken by the Hubble space telescope near opposition in 2018 July. 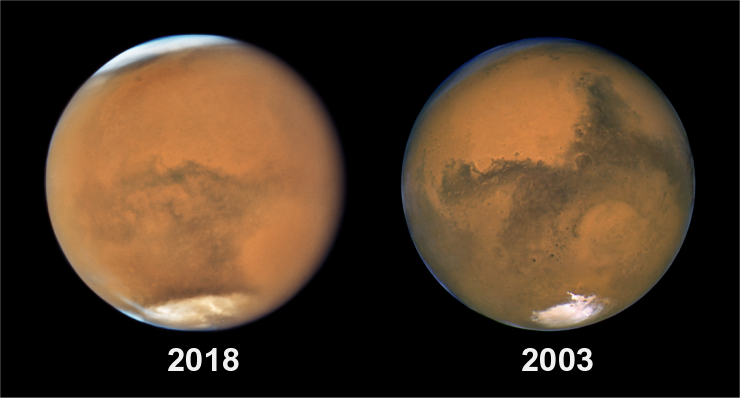 Here is a comparison with the opposition image of 2003, equivalent to that of the current cycle, when the atmosphere was clear. The difference of contrast between the two is impressive! The atmosphere is clear when all the dust has fallen back on the ground. This state is even more difficult to catch but is revealed by a revived high level of contrast on the ground details. This “normal level” of contrast can be easyer to feel with some experience of observing the planet, whether by images or visually. The eye is now detecting details without much difficulty and the imager doesn’t feel the need to overprocess images any more. Third phase. Details contrast is now higher, and the “edge opacity” effect is not detectable. Images from September 10th and 11th, 2018. This phase began by 2018 September and should be complete by October. Image the surface of Venus this winter! Uranus in visible light: what does the Hubble space telescope show?